Many important natural products such as antibiotics, immunosuppressants and cancer drugs are derived from microorganisms. These natural products are often small proteins or peptides generated in the cell by NRPS enzymes similar to a modern automobile factory: At each station, additional parts are added to the basic structure until finally, a completed automobile leaves the factory. With regard to the NRPS, a specific amino acid is incorporated and processed at each station (module), and complete peptides emerge that can be linear, cyclic or otherwise modified, including unusual amino acids. 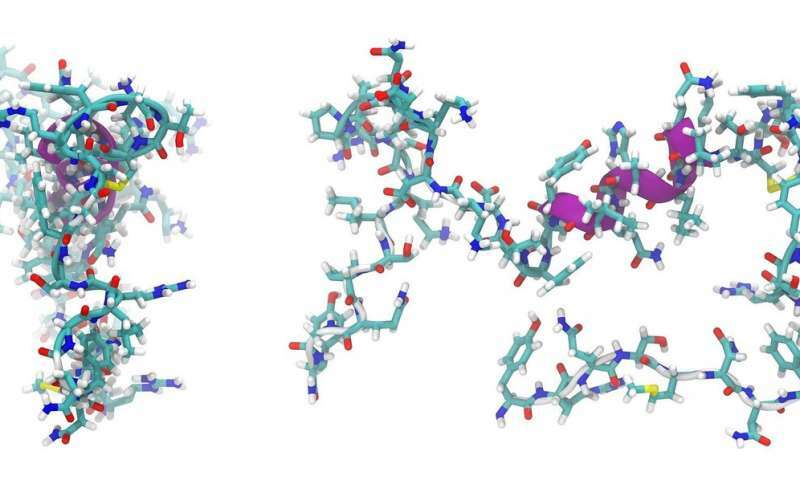 For larger peptides, several NRPS enzymes—or "assembly lines"—can operate successively. The order in which this happens is determined by docking domains. These are small regions at the end of the assembly lines that connect to the next NRPS enzyme like a key in a lock. Although the basic principles of these NRPS interactions have been known for a long time, the structure of the docking domains was unknown. Now, the research groups led by Professor Jens Wöhnert from the Institute of Molecular Biosciences and Professor Helge Bode from Molecular Biotechnology at Goethe University have described their structure. "We were able to determine the structures of individual docking domains and, for the first time, an NRPS docking domain pair as well," explains Carolin Hacker, who is a Ph.D. student in Jens Wöhnert's group. "This made it possible to clarify the rules for the interaction of the docking domains and to change them in such a way that new natural products will be generated," says Xiaofeng Cai, postdoctoral researcher in Helge Bode's group. "We are only at the beginning of our research: We need structures of additional and structurally diverse docking domains so that in the end we can utilise them like building blocks. Our goal is to connect various biosynthesis pathways and create totally new substances" Wöhnert explains. "Nature has been quite inventive in this area, and there are apparently numerous different ways to mediate the interaction of these complexes," adds Bode.